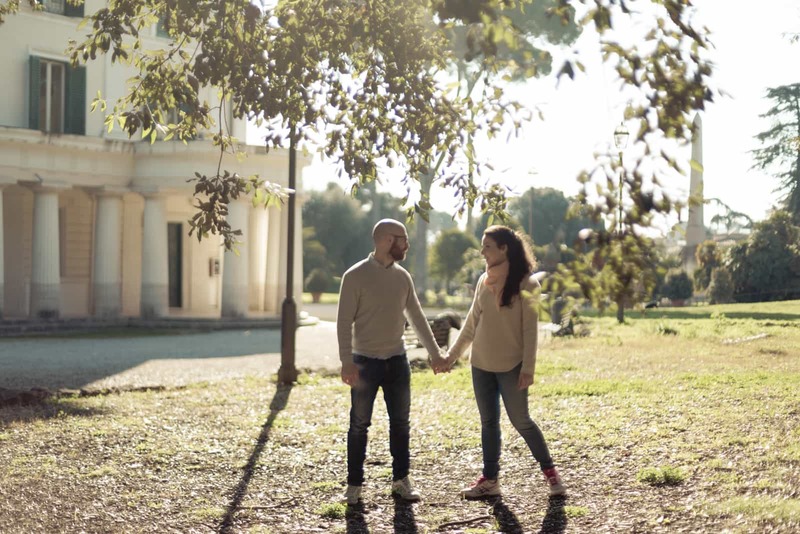 Engagement in Rome – Usually, I can meet the newlyweds up to three times before the wedding, but when we choose to make pre wedding photos is a great opportunity. A moment where we establish an important contact, we establish a deeper relationship and work together. Everything after it will certainly be easier. So it was for Valeria and Emanuele. We were seen a couple of times to know ourselves and for the paperwork, but to create custom holdings they decided to make premarital photos that told a little of them. On a Sunday morning of an incredibly vernal February, we went to Villa Torlonia, in Rome. A little cold, but beautiful place with a wonderful light. As assistant came to my trusty Dustin, a fantastic golden retriever which was more interested in the smells of villa’s meadow that to us. They are wonderful. Often we use emphatic tones when describing a couple, a bit for flattery, a bit to exaggerate the photos. It’s not my case, I don’t like exaggerating. But with them, it was really nice. They’re two real guys, lovers of volleyball and music (what I like too), in love very much and lovers of life. We studied together what to do, and I think the result is great! Anyway, tell them it was easy. We agreed together a few meaningful elements add to the photos, and I imagined some photos that could synthesize their essence. And I will never forget the gift that they gave me, remembering my birthday, a little volleyball which is now on display in my library in the office. My advice to every newlywed interested in my services is that put in your desires some premarital photos is a gift that you give yourself. Anyway, it’s the beginning of your story that will culminate that day, which will come very soon.